Tomas Berdych and Grigor Dimitrov open up play on Stadium Court on Sunday at the 2012 Sony Ericsson Open. Following that matchup, Venus Williams hopes to build off her upset of Petra Kvitova and move on to the fourth round when she takes on Aleksandra Wozniak. Other notable day session matches include Rafael Nadal versus Radek Stepanek on Stadium Court and Andy Murray versus Milos Raonic on the Grandstand. In the night session, defending Sony Ericsson Open champion Victoria Azarenka is looking to extend her 25 match winning streak in 2012 when she faces off with Heather Watson. John Isner versus Florian Mayer will close out the evening session. Opening day at the 2012 Sony Ericsson Open kicks off with four-time Grand Slam champion Kim Clijsters taking on Jarmila Gajdosova of Australia in first round action. Two-time winner at the Sony Ericsson Open, Clijsters is playing in her first event since her semifinal appearance at the Australian Open. Seven-time Grand Slam champion Venus Williams will also be taking to the courts during Wednesday’s day session. Williams, a three-time winner at the Sony Ericsson Open, will face Kimiko Date-Krumm of Japan in her first round match. On the men’s side, 2008 Sony Ericsson Open champion Nikolay Davydenko will face James Blake. Argentine David Nalbandian takes on Steve Darcis of Belgium. The night session is headlined by Fernando Gonzalez of Chile. A 13-year veteran on the ATP tour, Gonzalez is playing in his final tournament and will retire after the 2012 Sony Ericsson Open. Gonzalez’s opponent will be Nicholas Mahut of France. In the second match of the night session, American Christina McHale will face off with Galina Voskoboeva. In 2004, at the age of 17, Maria Sharapova advanced to her first major final and stunned the overwhelming favorite Serena Williams at Wimbledon. Seven years hence, in her second final at the All England Club, Sharapova ran into an intrepid twenty-one year old copycat. Petra Kvitova, a lefty from the Czech Republic, shocked the Russian 6-3,6-4 to prevail in her maiden major final. After Kvitova was broken to open the match, it seemed that nerves would be the deciding factor in the match. However, Kvitova manufactured triple break point and capitalized to get back on serve. Her next service game, Kvitova wiped out break point to hold for 2-1. Later, subsequent to a forehand winner by Kvitova, Sharapova double faulted to hand her opponent break point. Sharapova produced a second double fault to give Kvitova a 4-2 edge. With great serving, Kvitova consolidated for a 5-2 advantage. By relentlessly pressuring Sharapova’s serve, Kvitova came to her first set point when her counterpart dumped a forehand into the net. Yet, with an ace, Sharapova cleared that hurdle. Ultimately, Sharapova guarded serve for 3-5. Still, at love, a serene Kvitova secured the first set. The Williams sisters made their long awaited return to competitive tennis this week. Despite being rusty, with nine of the last eleven championships at the All England Club, Venus and Serena are among the favorites. Moreover, the Wimbledon draw sets up the potential for a fifth all Williams final. Here’s a more detailed analysis. World number one Caroline Wozniacki hopes to validate her ranking with a first major. However, Wozniacki will need to do some heavy lifting to achieve that feat. In the quarterfinals, Wozniacki may have to go through 2004 Wimbledon champion Maria Sharapova. In addition, for the Dane, a semifinal encounter with defending and four time winner Serena or reigning French Open champion Na Li may be in the cards. Needless to say, Wozniacki will have to work hard to earn her maiden major. Serena will begin her title defense by facing the talented Aravane Rezai in the first round. In the fourth round, Serena could see another sizeable French hurdle in 2007 finalist Marion Bartoli. Later, in the quarterfinals, Serena may clash against Li who is no push over. In Li’s case, Sabine Lisicki may present difficulties in the second round. Lisicki has been regaining her form and confidence as is evident with her recent title in Birmingham. Sharapova is again in the mix at another major. While a first round match with countrywoman Anna Chakvetadze could be testy, Sharapova should come through. Sharapova is likely to have a tougher time in the fourth round if Samantha Stosur is the opponent. Serena had been out of commission nearly a year. For the seventh seed to claim her fifth Wimbledon crown, she will have to come up with the type of performance which resulted in her surprise victory at the Australian Open in 2007. With Serena’s track record, it’s certainly hard to bet against her. Yet, with Ana Ivanovic, Maria Kirilenko, Flavia Pennetta and Julia Goerges in the top half of the draw, there is an endless list of players capable of pulling off an upset. Citing an abdominal injury, Venus Williams has withdrawn from the 2011 Sony Ericsson Open. 7-time Grand Slam winner, Venus Williams, has withdrawn from the 2011 Sony Ericsson Open. Williams is forced to withdraw from this year’s tournament due to an abdominal injury she incurred earlier this year at the Australian Open. The tennis star is currently receiving ongoing rehabilitation at home and released the following statement. Despite Williams’ withdrawal fans will still be able to see exhilarating matches as the women’s field features power players including defending Sony Ericsson Open champion Kim Clijsters; current World No. 1 Caroline Wozniacki; and three-time Grand Slam champion Maria Sharapova. 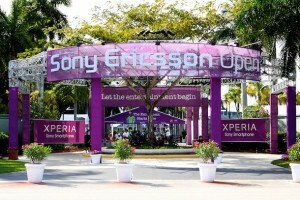 The 2011 Sony Ericsson Open kicks off on March 21 at the Tennis Center at Crandon Park in Miami. Today, the tournament released the acceptance list for the ATP and WTA tours. The field is stacked with past Major champions that including Rafael Nadal, Roger Federer, Novak Djokovic, Andy Roddick, Kim Clijsters, Serena Williams, Venus Williams, Maria Sharapova, Francesca Schiavone and Svetlana Kuznetsova. Roddick and Clijsters will attempt to defend their titles from last year. MIAMI, Fla. (www.sonyericssonopen.com) – The 2011 Sony Ericsson Open men’s and women’s player fields were announced today and the tournament will host a field worthy of a Grand Slam event with each of the top 77 ranked men’s players and 74 of the top 75 ranked women’s players in the world attending. Once again the world’s best players including Rafael Nadal, Roger Federer, Novak Djokovic, Andy Murray, Andy Roddick, Kim Clijsters, Serena Williams, Venus Williams, Maria Sharapova and Caroline Wozniacki will come together at the Tennis Center at Crandon Park, March 21-April 3 to compete for one of the most prestigious titles in tennis. 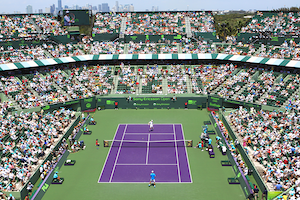 Tickets to the 2011 Sony Ericsson Open are on sale now and can be purchased by phone (305-442-3367) or via internet at www.sonyericssonopen.com. An electrifying two weeks of tennis conclude with the women’s final on Saturday, April 2 and the men’s final on Sunday, April 3. The qualifying rounds will be played March 21-22 and will determine 12 more slots in each singles draw, while the tournament will award five men’s wildcards and eight women’s wildcards. Women’s main draw play will begin Tuesday, March 22 with the men’s main draw starting on Wednesday, March 23. Clijsters, the defending Sony Ericsson Open women’s champion, and Djokovic, the Sony Ericsson Open men’s champion in 2007, are coming off victories at the Australian Open and will certainly be considered two of the favorites to win in Miami this year. But the contenders to claim the Sony Ericsson Open’s Butch Buchholz trophy in 2011 are numerous indeed. Rafael Nadal, a two-time Sony Ericsson Open finalist, will look build upon his incredible 2010 season which saw the Spanish star claim three Grand Slam titles and reclaim the World No. 1 ranking. Roger Federer, a 16-time Grand Slam champion, will return to Miami looking to claim his third Sony Ericsson Open title and his first since 2006. Andy Murray, the 2009 Sony Ericsson Open champion, is already playing in mid-season form having reached the Australian Open final and you can’t overlook defending Sony Ericsson Open champion Andy Roddick who always seems to play his best tennis on the purple courts at Crandon Park. The halfway mark has been reached at the Australian Open. While Kim Clijsters and Caroline Wozniacki are still in line to collect their first major Down Under, the dream is at an end for Justine Henin and Samantha Stosur. Here’s a look at the tournament’s past seven days. In the top half of the draw, world number one Wozniacki coasted into the round of 16. Despite difficult challenges from Gisela Dulko and Dominika Cibulkova, the Dane has yet to drop a set. Wozniacki will battle Latvian talent 20 year old Anastasija Sevastova who stunned Yanina Wickmayer in the second round. On the other hand, Henin, a finalist last year, was dismissed in the third round by Svetlana Kuznetsova. The 2009 French Open champion who appears to be fitter than ever will face reigning French Open victor Francesca Schiavone in the fourth round. The latter needed three sets in each of her first two rounds. There will be no Williams hoisting the prize this year. Venus was forced to retire one game into her third round match with Andrea Petkovic due to a pelvic muscle injury. Consequently, Petkovic will clash with Maria Sharapova in the round of 16. Sharapova scraped by Julia Goerges in the previous round. With Sharapova’s serve a continual sore spot, Petkovic has a golden opportunity to reach her first quarterfinal at a major. Both Li Na and Victoria Azarenka have been unforgiving thus far with straight sets victories to get to the round of 16. These two will now collide for a place in the quarterfinals.